NOTE Today I heard from two story artists simultaneously with exciting news via Mark Frauenfelder at boingboing.net: apparently that mighty elegant instrument, the extinct Blackwing pencil, is soon going to resume production. I wrote the post below ("Why My Blog Is Titled As It Is') in November, 2005, and it seems like a good time to give it an encore. They don't make them like this anymore. Really--they don't make these at all; production ceased in 1998, apparently. I love these pencils--they're a joy to draw with, although I rarely use them now (dwindling supply), but their real attraction is the association they can't shake for me--that of the Disney studio of the 50s, of sketch artists and draughstmen and designers working on immortal projects, not only at Disney feature animation but all over Los Angeles: the maitre'd at Musso's taking a reservation for four in 1933; a script supervisor working alongside Preston Sturges making notes during takes of "Sullivan's Travels"; a student at Chouinard toiling on a design project in 1961; Henry Miller, or Bob Clampett, or Clarence Darrow or Ward Kimball or Ernie Kovacs or Raymond Chandler. Who knows how many yet remain in the musty drawers of retired writers and artists all over the city, from Arcadia to Malibu? I first saw one of these on the desk of an animator at Disney's in the early 80s, and later on the desk of Cecil B. DeMille, untouched since his death in the 60s; there were some among T. Hee's studio ephemera, given to us at CalArts after his death. I ordered an entire box from the redoubtable Cartoon Colour Company of Culver City, many years ago. Little dreaming of its eventual demise, I recklessly scrawled away, and now my Blackwings constitute barely a fistful, from stubs to pristine unsharpened. It's a thoroughly romantic instrument: sleek and silvery, fast-moving and easy to sharpen, with a curious back end--a golden holder encasing a silver clasp cradling a removable eraser, the better to extract, flip and so extend its usefulness. Among both pencil enthusiasts and stubborn pencil-wielding animators, it fights for prominience with the fat, round, green Blaisdell Layout, most famous as the longtime-preferred pencil of Glen Keane. I have a stub of a Blaisdell somewhere--really, a stub, barely two inches long. It's easy to see why it's so appealing, as it skates smoothly over the paper--best used as a blunt instrument with its wide smear of soft lead. But I still swoon for Blackwings--surely the only pencil which bears its own motto--in quotes, no less--across its length: "Half the pressure, twice the speed". And it certainly seems to be so. A sorry world where such treasure is allowed to pass away. I am old enough to know it's the little things in life--particularly in an artist's life--that immeasurably enhance the day to day grind. So, the Blackwing: I look over my shoulder and admire the gleam of the golden lettering on my desk. A glorious instrument with all the possibilities that art provides at its tip. And thus the blog moniker. There's an excellent review of an "old" Blackwing here. Very much worth a click. hey jenny! i had found your blog when looking for info on the blackwings in reference to aniamtion some time ago, and it really helped me get excited about pencils again. because some smaller silly reviews i did with the palomino earlier this year california republic pencils just got in touch with me about reviewing the blackwing. i saw your comment on boingboing about you not being included and i emailed the company telling them to get in touch with you with some samples for review! i hope they do! A million thanks, smo-they did! It'll be fun to try the new ones out, and I can't wait to read your review as well as the others. Very cool. A shameful confession: both the history and the renewal of these pencils were complete news to me. And though my next confession marks the first bandwagon I've jumped on for ages, I must say this post has made me very eager to try the Blackwing. This will devastate the Blackwing black market on ebay. Bill Matthews, teacher, first year animation, Sheridan, raving about Blackwings (my first intro to them):"Just gimme a Blackwing and let me go!" I've still got a box with 3 half used Blackwings that Billy Wilder gave me. He used them while writing. Won't be using those...so I'm glad they're making them again. Thank you very much for the kind mention and link! I'm also very curious about the new offering. Could those precious drawing pencils be available in Britain? I've always heard about these pencils and how so many great animation artists have used them, but have never tried them myself because of how scarce they've become. I was only four when production ceased on these pencils by the way. If they do start making them again, I'll certainly be inclined to try them, even though they seem very hyped to me. Have you had a chance to try them out? I just caught a review of the new Blackwing on BoingBoing. It didn't sound like the new one quite held up to the standards of the old, but there is a lot to be said for the amount of sway nostalgia can give for a products review. Either way, as I have never had the chance to work with an original Blackwing I am looking forward to grabbing a few of the new release so I can feel like I am part of the elite club! 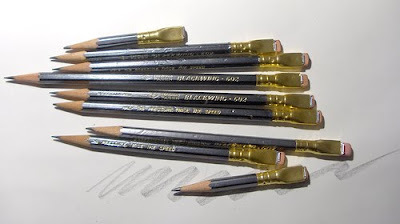 Jenny, I have a dozen or so unused Blackwings that I've been saving for 20-25 years that I'd be willing to sell. (I have more but am not sure how many I can bear to part with!) I've decided I don't need all the ones I've saved and am going to share the wealth. If you're interested or know anyone who is, feel free to e-mail me at kiloran [at] aol.com, with something in the subject line that lets me know it's not spam. And let me say that my socks are knocked off to think that one of the posters here knew Billy Wilder. Whew! I think that you stated in that one sentence, the very essence of what it means to be an 'Artist'! Have you placed an order for the new Blackwings yet? Ernest Hemingway used them as well. A friend of mine showed me your blog and I have to say I love your work. When I saw the posting on the Blackwings I went rooting through my studio at home and found an old box with 3 left in it. I even like the graphics on the box. I may have to sacrifice one to the pencil sharpener and have some doodling fun. I've got a question; the review on the Blackwing said it was discontinued due to lack of sales, I thought that it had to do with the lead content of the pencil. Which is correct? Well, never mind my previous comment! I'm forgetting my pencil history where the use of actual lead is concerned. It seems that it was discontinued due to low demand and a certain broken machine that made a part for the pencil. file this under the one that got away. yesterday 108 blaisdell 616-t layout pencils, six dozen of them still sealed in their original boxes, sold for $348 on slaybay. I'll bet you know who got them too...you? Whoever it is-the lucky stuff! I envy them. "Tangled" ...Not that I dont love that movie (and not that I didnt love the gift) but I thought for sure that she had gotten me a Blackwing. The family stood around me and congratulated the dvd, and I looked at her to say thank you and she whispered... "flip it over..." so I did slowly... and taped to the back of the dvd, I saw the golden words "Half the pressure, Twice the Speed" across the crisp charcoal colored barrell of the legendary pencil itself! I took it out and examined the instrument with poise and precision. I looked at her and I am sure that she understood my feelings for her and what she had done for me. After I had finished thanking her for what she had done, she pulled a worn chest about the size of a loaf of bread from behind her with a lock on it, She opened the box, and when I looked inside... ELEVEN more pencils were found. She left the box open for me to oogle at. Right before I walked at the ceramony, my student councilor asked me "Why do you have that pencil in your hand?" and I said "Because its not just any pencil! Its more than that! Its the Eberhard Faber Blackwing 602." And she said "But WHY do you have it?" and all I said was "You know what? ...I just cant explain it to you." So I walked across the stage with the pencil in my hand! A week later the pencil was returned with it's brothers and have been locked away safe and tight. Hopefully I will see them again, sooner rather than later. But heres the catch 22, my beautiful, thoughtful, and most amazing girlfriend has decided to keep the key to the boxes lock, so that she may see the artist who earned the use of the Blackwing Pencil! Whether we are still simply dating, married, or seperated she wants to share that day with me! I have never met a person who has shown so much faith in me. And at times when I do a bad drawing and I feel like I wont be able to make it, She has given me the strength to move forward! Anyway Jenny there is my story! I hope you have found some inspiration too! And I hope you keep doing what you do best! Cause your work, your blog has left a MASSIVE impact on my life, (obviously) and I have so many thanks to give to you! So thank you! ESPECIALLY a big thank you to my girlfriend who did such a selfless thing for me! Thank you to all of you who have inspired me, and thank you to all of those who are inspired!